Good evening! I have my second look for Negative Space Week with The Digit-al Dozen to share with you today. For this look, I went with bold half moons, matte, and textured polish. Three fun elements that add so much to a typical mani and I loved wearing these! French tip guides are all you need to create this look. To begin, I had on a clear base polish that was completely dry. I used french tip guides to make half moons at the cuticle line. 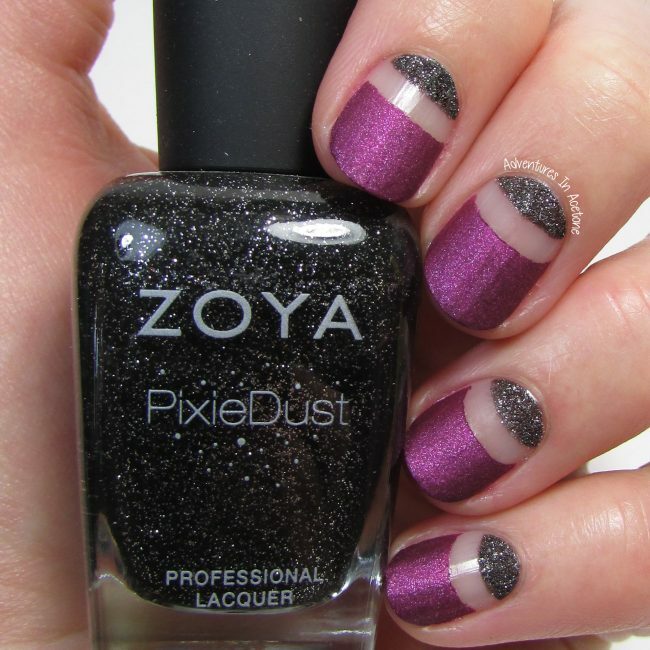 I did two quick coats of Zoya Dahliah Pixie Dust on the half moon sections of the nail, and two quick coats of Zoya Harlow Matte Velvet on tip side of the nail, slightly overlapping the french tip guide sticker for a clean line. While they were still relatively wet, I carefully peeled the french tip guide off of the nail to reveal the negative space. I omitted top coat because I really wanted to keep the fun textures of the matte and pixie dust polish. These are so fancy looking! Mixing the polish finishes was really smart too! Interesting combination of matte and sandy textures!